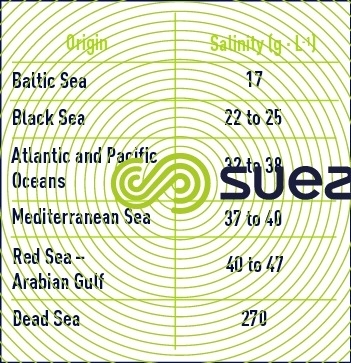 The salinity recorded in the various oceans and seas throughout the world is the product of an equilibrium achieved between evaporation, rainfall and the input from rivers (low salinity) on the one hand and water exchanges with the other seas or oceans with which these different seas or oceans are connected on the other hand. 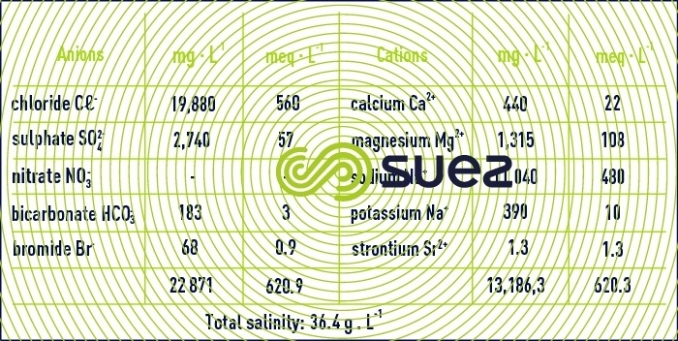 Therefore, this salinity is extremely variable as shown in table 2. Note: table 3 provides an analysis of the reference seawater used: ASTM water at 36.4 g.L-1 indicating the respective contribution made by the different ions. Depending on the use made of seawater (cooling water, feed water for a desalination unit etc. ), properties other than salinity alone may prove extremely important and may be subjected to very marked fluctuations as shown in table 4. Zooplankton and phytoplankton are the main suspended solids found in the high seas. However, even in the most prolific seas (cold, highly oxygenated seas), plankton rarely accounts for more than 1 mg.L-1 of suspended solids even when algae blooms of more than 10,000 cells.mL-1 have been recorded. Conversely, close to the coasts, wave and/or tidal effects can return several tens of mg.L-1 of sand, silt and other deposits into a suspension. Additionally, close to urban centres, industries, ports, etc., pollution can become significant because the sea’s self-purifying capabilities have been over-estimated. Excluding recent pollution, dissolved organic matter is principally created from non-biodegradable humic acids, the final decomposition stage for organic matter of plant origin. Dissolved organic matter concentration can be deduced from the TOC measurement (warning: this measurement becomes difficult in the presence of the chlorides contained in seawater) or more easily from their UV absorption (please refer to the example provided in table 4). However, pollution generated by Man’s activities can be characterised by the TOC measurement and by specific measurements such as those applied in the case of freshwater: hydrocarbons, organic N, polysaccharides, etc. In estuaries, where the river flow meets the seawater and tidal effects (where seawater flows up into the river bed and, sometimes, the presence of a tidal bore), these phenomena are the causes of major and sudden changes in salinity and in the supended solids content of water sampled at a specific point. The agitation generated when the current reverses reinstates sediment suspension with the formation of "silt plugs" where the suspended solids content can reach several g. L-1.